With all the grand history that will unfold to all who visit the middle of America (Mesoamerica) there are a few important things one must know. First, there were no beasts of burden the ancient American’s domesticated. To put it in perspective, the heaviest mammal in Belize would be the Bairds Tapir, a calm and collected herbivore that boasts relatives in the Horse and the Rhinoceros. Its so weird-looking, its cute and it can weigh up to 500 pounds. Secondly, there were no cereals such as wheat, flax or rice like was grown in the Fertile Crescent, the Sahel zone of Africa or the Far East, respectively. Impressively, people in the aforementioned areas were farming by 10,000AD! That “Old World” area of the planet (Inclusive of Africa and India) domesticated 13 of the 14 (93%) of all the ancient domesticated beasts of burden. Mesoamerica, or in extension, the American mainland, could only boast one and it was barely a beast of burden and its native home still is the Andes Mountains of South America – the Llama. Third, the weather in the Northern part of the Old World (Europe) was mild for the most part of the year that gave the people living in those areas of the world a geographical “first jump” on favorable options of agriculture and development from Stone Age to copper and to the Iron Age. Mesoamerica, with all its major ancient development, was not that lucky with the weather. What Middle America grew was corn. It was “invented” in Mexico around 3500AD. From this part of the world it diffused North and South to the rest of America. It is important to note that corn originally was not planted as corn. No, it actually came from a wild plant called Teosinte. This has been debated strongly by botanists over the years because Teosinte and corn look so much different from each other. Today, over half the calories consumed by humans come from cereals, corn included. The ancient Maya and other American natives actually have corn gods to give you an idea of how important this food was. In fact, the Maya incorporated it in their mythology as created in the underworld and found inside a sacred cave – a gift from the ancestor spirits and from the corn god himself, the father of the Hero Twins. Corn was a part of a nutritional trinity. 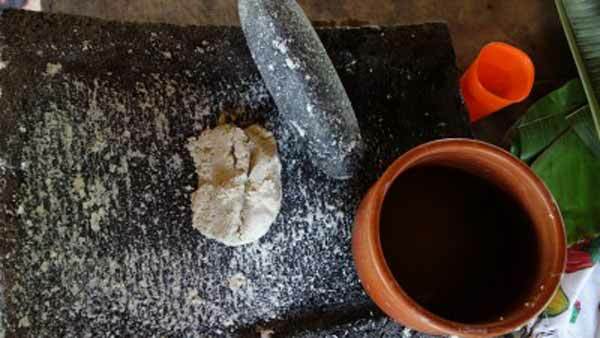 Alongside beans and squash – a perfect Mesoamerican diet. Every so often the protein from meat injects a little bit more energy into the diet. Corn, the gift from the gods; the vital piece of the nutritional puzzle of early Americans the grain that was worthy of a created god. Its nutritional value to ancient Mesoamericans made it the most important grain then and largely, it is the most bountiful grain still.